This relationship became hugely successful and in 2002, Jack unleashed his idea to design and create a juicer that was purely dedicated to health and fitness. Over the next two years, sales of Jack LaLanne Power Juicers soared to well over 2 million units, which helped to establish Jack LaLanne Power juicers as an iconic brand. 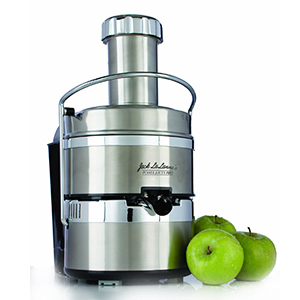 When it comes to simplicity and functionality, the Jack LaLanne Power juicers are in the top league of the best juicers. They are really easy to take apart and clean, and can be assembled back to functioning juicer in seconds. The Jack LaLanne Power Juicer is the one that started it all: the original “As Seen on TV” juicer that was fully endorsed by Jack LaLanne himself. What this juicer lacks in extra features it more than makes up for in terms of raw power. The 3,600 RPM motor on this juicer is both quiet and powerful, able to puree any fruit or vegetable you put into it. An extra-large feeder chute means you can drop in fruits and vegetables directly into the juicer with little to no prep time required. The extra large detachable pulp collector means you’re getting buttery smooth juice with no chunky bits while the dishwasher safe parts mean that cleanup is quick and easy. As an added bonus, this juicer also comes with a recipe book featuring not just classic juice recipes but also new concoctions you would never have thought to try. 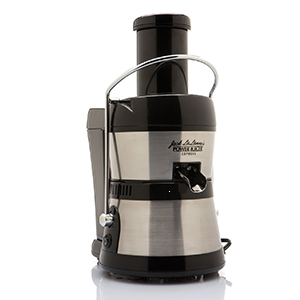 When you need a bit more power than the Jack LaLanne Power Juicer can give you, then it’s time to turn your attention to the Jack Lalanne’s 100th Anniversary Fusion Juicer SLH90. 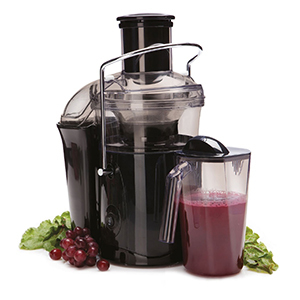 The SLH90 juicer ramps up the power considerably, upgrading to a powerful 800-watt motor. The feeding tube can accommodate fruits and vegetables up to 2.8 inches wide, letting you put entire oranges and tomatoes directly into it. The extra-large capacity of this juicer lets you mix a broad range of fruits and vegetables together, letting you make delicious drinks that just aren’t possible with the competition. The two-speed power switch lets you adjust the speed on the fly while the stainless steel blade ensures that even the toughest fruit or vegetable will end up as a delicious juice. You’ll need a container to store your amazing juice and luckily for you, the SLH90 juicer comes with an extra-large pitcher. The adjustable no-drip spout on this juicer will guarantee that all of your juice ends up in the pitcher and not on your counter or, even worse, your floor. When you don’t have time to wait for a cup of fresh juice, you need the Jack LaLanne Power Juicer Express. This juicer’s 3600 RPM motor is not just as quiet as a whisper but it also can make a scrumptious cup of juice in only a few seconds. No matter which fruit or vegetable you put into the extra-large feeding tube, you’ll be ready to enjoy your juice in the time it takes for you to grab a cup. The patented technology in the Jack LaLanne Power Juicer Express will squeeze out 30 percent more juice than the competition, getting you more of the vitamins, nutrients, and flavor that you crave. This juicer is also compact, letting you place it almost anywhere in your kitchen where there is a free spot. Want the features of the Jack Lalanne’s 100th Anniversary Fusion Juicer SLH90 with the silence and size of the original Power Juicer? Then look no further than the Jack LaLanne Power Juicer Deluxe. The Power Juicer Deluxe combines the quiet 3,600 RPM motor of the Power Juicer with the stainless steel cutting blade and no-drip spout of the SLH90 to create a powerful, quiet juicer that can handle any fruit or vegetable while not making a mess. This model also features an extra-large chute and high-quality food pusher to ensure you’re getting the maximum yield from whatever you put into this juicer. As you’d expect from a Jack LaLanne juicer, cleanup is quick and easy thanks to a majority of parts being safe to put into the dishwasher. 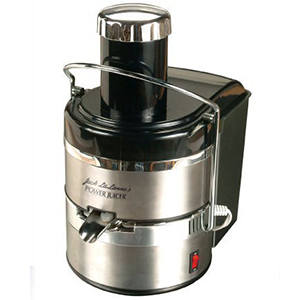 The lifetime motor warranty on the Jack LaLanne Power Juicer Deluxe gives you the peace of mind that once you buy this product, you’ll have a high-quality juicer for the rest of your life.